This feature covers a wide variety of delicious recipes for vegetarian and vegan food. The recipes are obtained from many different sources and build into a full reference library covering all occasions from quick snacks to formal meals. The recipes are likely to make even the most committed carnivore or omnivore think again, while the discerning vegetarian or vegan palate will rediscover just how good such food can taste. Vegetarian Cuisine in April features pav bhaji (leftover vegetables) and aloo tikki (fried potato cakes). Recipes are provided courtesy of Maunika Gowardhan, who runs Starters and Spice, a bespoke Indian catering company. spanish omlette with parsley & olives. Kathryn Marsden’s carrot cake (HRT recipe). 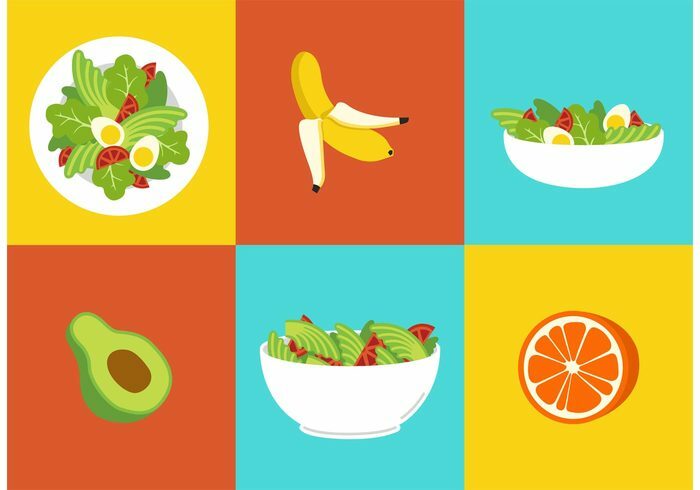 Use of visual presentation of food comparisons. Taken From PICTURE PERFECT WEIGHT LOSS by Dr Howard M Shapiro, published by Rodale. 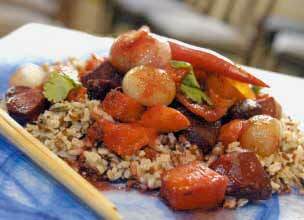 Poached figs, apricots and cherries. Tips for cooking British asparagus. Jewel green rocket soup with parmesana potato polenta. 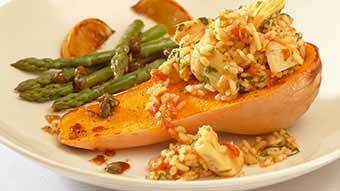 Smoked garlic & artichoke risotto and roasted butternut squash with lemon asparagus in a balsamic dressing. Gingery fig & rhubarb filo flowers. Also, history and health properties of shallots. Chocolate & brandy truffle torte. January recipes reproduced courtesy of THE GREAT AMERICAN DETOX DIET by Alex Jamieson, published by Rodale. February recipes are reproduced courtesy of the book ENERGY FOODS published by Duncan Baird Publishers, available on special offer to readers of Yoga & Health magazine. Please see page 42 of the February 2006 edition for details. Spicy tofu with sesame seeds and chinese five spice – low saturated fat. Lavender yoghurt cheesecake with kaffir lime flavoured strawberries. Carrot, orange & banana semolina cake. These are reproduced courtesy of the book ANTI-AGEING COOKBOOK by Robyn Martin, published by Ebury Press, and available on SPECIAL OFFER to Yoga & Health readers. See page 44 of the June 2006 issue for details. Please note: not all recipes in this book are vege. Peas with little gem and spring onions. Carrots roasted with parsnip, celeriac, lemons and coriander seeds Moroccan carrot purée with coriander and cumin. Baked banana with chocolate dessert. Balsamic salad of roasted leek and red pepper. Red hot soup, containing red peppers, garlic, onions, leeks, celery red chilli rosemary, carrots, potatoes and chopped tomatoes. Recipes and illustrations reproduced courtesy of THE BIODYNAMIC FOOD AND COOKBOOK by Wendy Cook, Clairview Books and available on SPECIAL READER OFFER , see page 44 of the Yoga & Health magazine November 2006 issue. Sin-free squash and pepper stacks (can be vegan or veggie vegan). Beetroot and pomegranate halo soup (can be vegan). Angelic lemony leeks and sprouts. Adam Keen is a Yoga enthusiast and cook who tries to incorporate Ayurvedic principles into his everyday life. Shiitake, ginger and tofu hokkien noodles. February recipes are reproduced courtesy of the book LOW GI VEGETARIAN COOKBOOK by Dr Jenni Brand-Miller published by Hodder Mobius, available on special offer to readers of Yoga & Health magazine. Please see page 44 of the February 2007 issue for details. Broccoli eggs benedict. The feature also outlines the history and ‘food facts’ about tenderstem broccoli. Creamy extra dark chocolate fondue. April recipes are extracted courtesy of the book THE MODERN AYURVEDIC COOKBOOK by Amrita Sondhi, Arsenal Pulp Press. May – Eat up and pep up: recipes from Viva! Recipes by Fiona McDonald Joyce, Dip ION, m BANT. Pasta salad with broad bean pesto, Minty broad bean dip and summer Bean, pea and feta salad. Recipes are courtesy of THE GATE EASY VEGETARIAN COOKBOOK by Adrian & Michael Daniel, published by Mitchell Beazley, with photography by Richard Jung. Available on SPECIAL OFFER to Yoga & Health readers. See page 45 of the August 2007 issue for details. Recipes courtesy of BIRTHDAY PARTY by Tracey Benton, Ziegel Publishing. Fiona McDonald Joyce Dip.ION, mBANT is a nutritionist and cookery consultant who has written a number of bestselling books, including The Holford Low GL Diet Cookbook and Smart Foods for Smart Kids, co-authored with leading nutrition writer Patrick Holford and published by Piatkus. Pumpkin and pasta, served in the baked shell of the pumpkin. Reproduced courtesy of the book VEGETARIAN: 200 CLASSIC RECIPES SHOWN STEP BY STEP by Roz Denny and published by Lorenz Books. Also available on SPECIAL OFFER to readers of Yoga & Health magazine. Please see page 45 of the November issue for full details. Copyright Anness Publishing Ltd.